Snap Track Conduit Bracket attaches to Snap Track Cable Tray to allow exiting of the tray via conduit. The conduit can be secured to the bracket by strut clamps. (2) Patented Push Pins are provided for a secure attachment. 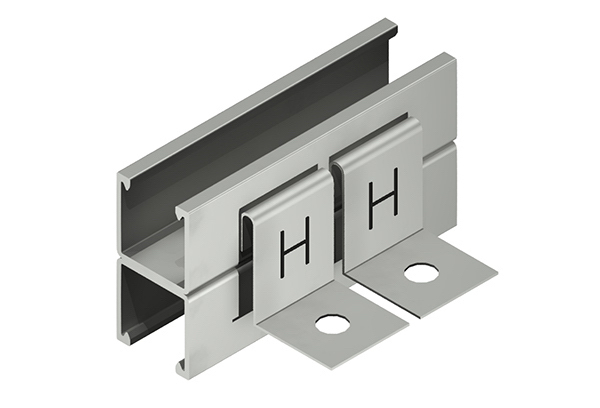 SnapTrack Conduit Brackets allow for an easy transition from cable tray to conduit. The two (2) hold down clamps slide over the inside wall of the tray and are secured by two (2) patented push pins. The cable can exit either from the top or bottom of the tray. Conduit is secured utilizing traditional strut clamps. NOTE: Strut pieces are 1 5/8” x 1 5/8” solid, back to back with 2 hold down clamps.